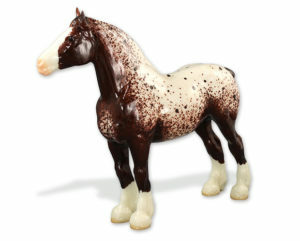 Home » Model Horse	» Breyer Collector’s Club Test Color Clydesdale Mare Lottery! Breyer Collector’s Club Test Color Clydesdale Mare Lottery! 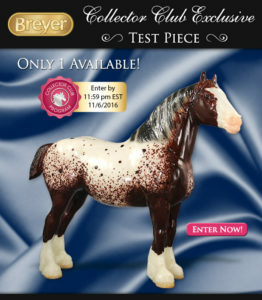 Breyer is once again offering Collector’s Club members a chance at a one of a kind Test Color. 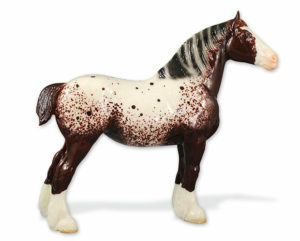 This time it is the Clydesdale Mare mold in a glossy bay appaloosa. Members may enter the lottery once a day until 11/6/16 at 11:59EST. If chosen, the purchase price is $850. This horse isn’t my particular cup of tea. I likely will pass on her. I’m sure someone would love to own her! Will you be entering? Exclusively for Breyer Collector Club Members! Exclusively for Breyer Collector Club members! Breyer test run models are initial decos painted up to see how a particular color might look on a particular sculpture. Or, they may be created to test out a painting technique or new colorway. Not all test run models are used, and they may vary over time as different painting techniques are developed and tested. Each model has a fixed price and interested members enter a random draw for the ability to purchase the test piece. Introducing a Glossy Bay Appaloosa Draft Mare! This pretty test run has splatter spots in a semi-leopard coat, a variegated black and white mane and four high socks. A high gloss finish adds to her unique appeal! The Bay Appaloosa Drafter test piece is priced at $850 and comes with a certificate of authenticity. Only 1 piece is available for purchase. In case you missed them, I have linked my blog posts to some of Breyer’s Test Color lotteries below. Without a doubt, thus far, the Indian Pony was my favorite offering. Indian Pony Exclusive Test Piece For Collector’s Club Members! 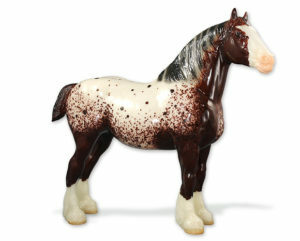 Exclusive Test Piece Lottery For Breyer Collector’s Club Members! 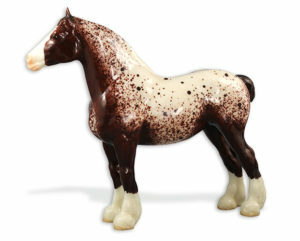 One Response to Breyer Collector’s Club Test Color Clydesdale Mare Lottery! « Breyer 1771 Unicorn Xavier Available To Purchase!